Man or woman, simply winning an ultramarathon is impressive. The grit required to not only make it through 50 or 100 miles but also to do it faster than anyone else is mind-boggling. Which is why SaltStick-sponsored athlete Michelle Barton’s race record is so incredible. She hasn’t won just one race … she’s won 76 of them — most of them ultramarathons. Of course, winning as a female isn’t enough for this hard-core endurance athlete; five of those wins have been overall wins, meaning she beat all the women and all the men. How does she do it? And more importantly, why does she push her body to the limit every day? In this blog post, we talk with Michelle about her running backstory, her training and nutrition advice, and her proudest moments as an endurance athlete. Read on to discover more about Michelle’s incredible success in the sport of ultrarunning. *For other stories of sponsored athletes, check out our posts on Lauren Goss and Katie Spotz. Fifteen years ago, you may not have guessed that Michelle Barton would eventually become one of the best ultra-distance runners alive. Back then, Michelle pursued trail running as a way to hang out with her dad, who was an avid fan of trail running. Even though she had to combine running and walking to keep up, she joined her dad in a few shorter trail runs and was quickly bitten by the running bug. Needless to say, Michelle is pretty badass, and we love sponsoring her. Not only is she a fantastic runner, she is also a great motivator. Anyone who followers her Instagram knows she’s constantly out running through California trails, or giving words of encouragement to members of the ultra community. Michelle’s proudest accomplishments: In 2015, Michelle joined running partner Majo Srnik to race the Badwater Salton Sea 81 mile ultra. She broke the female course record in 17:02, and she and Majo placed first among the co-ed teams. This race, as well as “finishing Badwater 135 mile in 2010, winning TransRockies in 2007 and winning Javalina Jundred 100 mile in 2006 and Javelina 100k in 2013 and beating all the men” are Michelle’s proudest moments. What is Michelle up to today? As of this blog post’s publish date in 2016, Michelle is training for Badwater 135 (often referred to as the “toughest footrace in the world”) running the Canadian Rockies, and running through the 218 mile John Muir Trail. According to Michelle, when it comes to training for ultras, quality is far more important than quantity. You also need to learn how to hurt. Michelle is also a big fan of active recovery. Instead of lying on a couch all day watching TV, her recovery methods include swimming or spinning out her legs on a mountain bike. She also makes sure to eat a clean, vegetarian diet (more on this below), and includes foam rolling or gym work as well. Like most professional endurance athletes, Michelle rarely struggles with motivation to get out the door. Instead, she often has to force herself to rest when she needs to. Michelle admits that this has sometimes meant that she only gets adequate rest when she’s struggling with an injury. A vegetarian for 25 years, Michelle’s approach to nutrition is pretty simple. “I eat anything I can find when I am hungry and move on,” she says. Michelle is a big fan of watermelon, she says, and she likes salads with broccoli, kale, spinach, raw vegetables, balsamic vinegar and hummus. “I felt drunk and weaving up the trail trying to make it to the last aid station on top of the last climb. I had no idea what was happening to me,” she says. Based on her symptoms, Michelle was likely suffering from hyponatremia, a dangerous medical condition marked by low blood sodium levels. Among other things, hyponatremia can lead to headaches, vomiting and — in Michelle’s case — extreme fatigue and disorientation. Luckily, other runners noticed Michelle’s condition and sought help from an aid station. Volunteers walked Michelle to help and gave her two SaltStick Caps to restore her electrolyte balances. Since then, Michelle has been a regular SaltStick user, and takes one Cap every 45 minutes to an hour. She says she has never cramped on long runs — even in the heat of Badwater 135. Michelle is such a fan of SaltStick, she even gives Caps to her crew when running Badwater. Michelle didn’t grow up running ultras, so she knows what it’s like to be a beginning runner later in life. Her advice to novice runners is to build slowly, and avoid putting too much emphasis on time and pace at the beginning. As you become more fit, you’ll naturally get faster. She also pointed out that it’s important to learn proper running technique in order to prevent common injuries. Want to know more about Michelle Barton? Follow Michelle on social media by checking out her Facebook, Twitter and Instagram. She’s very active on Instagram, and posts incredible photos of her trail runs throughout the week. To enter, all you need to do is tweet or Instagram this blog post by Friday, March 18, using the hashtag #InspiredByMichelle. 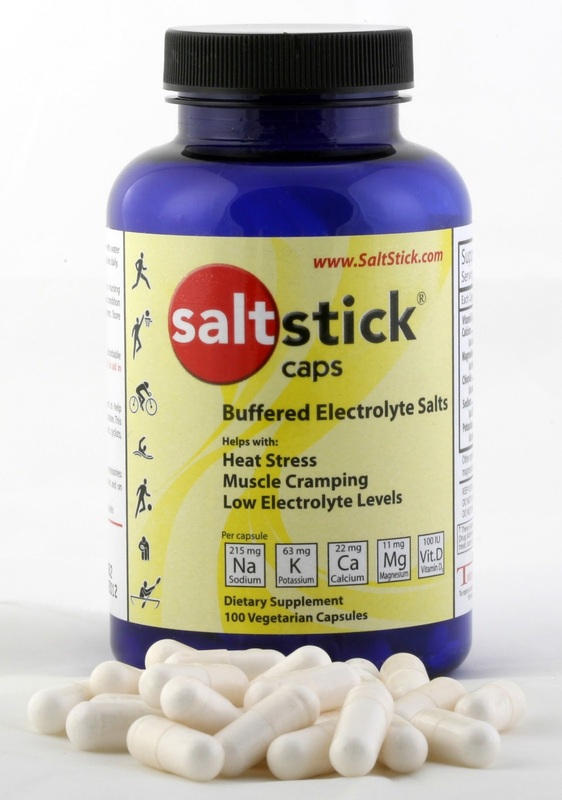 Featured in this blog are SaltStick Caps, which are the ONLY electrolyte capsules that are formulated to closely resemble the electrolyte profile lost during activity: sodium, potassium, calcium and magnesium. Learn more about them at saltstick.com.